Image credit: CraftWorks Restaurants & Breweries. 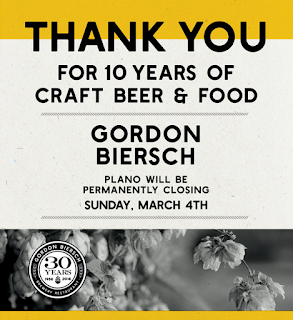 By way of a post on its Facebook page, the Plano location of Gordon Biersch Brewery Restaurant has announced it will close this Sunday, March 4. Opening in The Shops at Legacy in 2008, the Plano restaurant represented Gordon Biersch's first foray into North Texas. A Dallas location on Park Lane followed in 2009, but that too closed in October of last year. Both arguably filled a niche by arriving on the scene prior to the current craft beer boom, with Gordon Biersch even opting to distribute bottled beer to Texas for a short time. 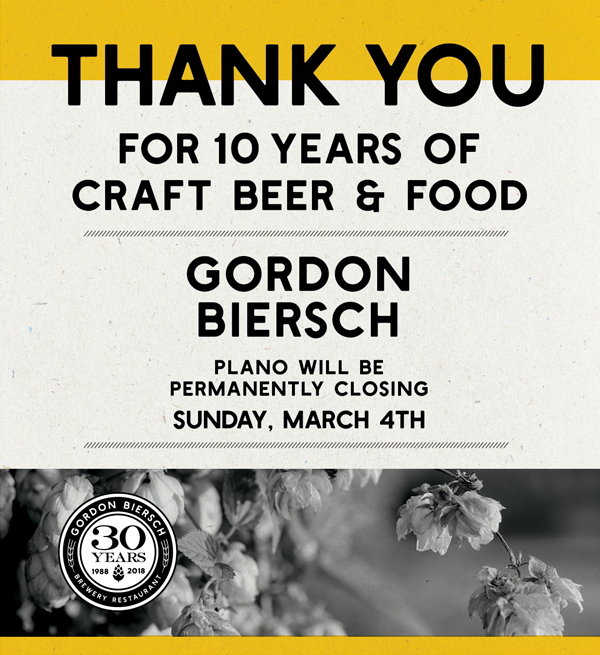 With these closures, the Gordon Biersch brand will no longer be represented in North Texas, and the brewpub's parent company, CraftWorks Restaurants & Breweries, will no longer have an active brewing entity in the area. Craftworks does, however, continue to operate a number of Old Chicago Pizza and Taproom franchises in the region. These can be found in Dallas, Fort Worth, Garland and Cedar Hill.